The Treasure Trail Badge Marathon has started, with Pogo_Spike gifting every Club Pogo member the Premium Badge Album containing 10 Treasure Trail challenges. 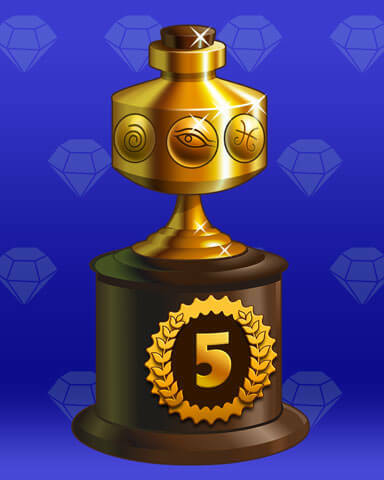 If you complete all 10 badges before 11:59pm PDT on April 16, 2019, you’ll earn a bonus completion Badge Marathon Badge. The bonus Badge will appear in your Special Edition Badges Album. If you don’t complete all 10 before the deadline it’s okay — the 10 free badges are yours to keep and work on at your own pace. Make 40 5-letter words in 2 weeks! Meld 25 Jokers in 2 weeks! Find 220 objects in 2 weeks! Score 3000 points in 2 weeks! Complete 35 games in 2 weeks! Make a ‘Nice Combo’ or better 60 times in 2 weeks! Drop 25 power-up stones in 2 weeks! Pop all the red balloons in the game 7 times in 2 weeks! Water 40 Thirsty Plant Cards in 2 weeks! Find 260 objects in 2 weeks! I find it a VERY nice album. NO Quinns and a nice selection and all challenges seem fairly easy. Thanks again pogo for no Quinns. A Nice Combo is two or more consecutive matches. In one game you can make several Nice Combos if you are willing to wait in between making the two consecutive matches. Nice album, lots of variety, I will tackle this one. I also would like to know what a nice combo is. Very nice album, I already activated Way with Words since I am spending most of my time playing it for the Great Egg Hunt Week 2. As soon as I complete the 40 5-letter words I will activate Jewel Academy for Wednesday’s challenge. Wish I could activate both but I don’t think I can. I’m with you……..ENOUGH ALREADY!!! There is more to playing games in Pogo than marathons, LIKE JUST FOR FUN and not stressing out to make a “theme” goal!!! I’ve dreaded seeing , “a gift” notice for Pogo thinks that they have come upon a winning cycle but it is tittering on edge of burnout with this constant offering and/or striving to win marathons. Yes, another marathon – oh joy!!! (NOT!!) It seems like lately all pogo is offering marathon after marathon – with no breaks!! Please before anyone says anything: I KNOW that I don’t have to do every game. I finally stopped playing the egg hunt — they ask for too much. Working and going to school is hard – please bring back the “old days” when there was a marathon once in a while. I am getting close to 10,000 badges and, once i am there, my time with Pogo will be cut short. It is a shame — I have been a loyal player for 10 years and now the change has been too much. Uncle!! I cry Uncle. I know I don’t have to do every marathon and I don’t. But we keep being told to finish certain games such as Java and Flash games as they are being discontinued. but are not given free time to do them. Some of us have others things to do besides Pogo. One or two marathons a month is actually more than enough. I couldn’t agree more. I would have been thrilled if is was Word Whomp or Boggle Bash. But AWWW makes me nauseous. I totally agree also. I love all these challenges as it gives me something to work towards. One question…….where do I find thirsty plants? lol Don’t you know, I always have a question. lol Thanks ahead for the help. Can we only do one at a time in this album? Some of these I can’t just work on all the time. AWWW I just finished finding 200 – 4 letter words and now this one and still working on the 3 letter words. I am getting tired of word games. We have a couple more coming up in the Egg Hunt. When you are doing a badge from a PBA it’s always been just 1 at a time. I like all the free badges that I can get. Their will be a time when you have nothing new to do so then you can finish these badges. having just completed that horrible AWWW challenge yesterday, seeing another makes me mad! I’m about done with going crazy trying to finish the non stop challenges running lately. And these albums have nothing but ugly badges to add to the frustration. I don’t care about these badges or killing myself just to get a completion badge. I can’t recall if the completion badges look any better since they just add to the pile of useless badges. I’m not sure why pogo is doing this to (for?) us instead of redoing some great old games instead of just removing them. It’s a hard decision to leave club pogo after more than 15 years but getting easier to see that happening! Took me 6 tutorial rounds to get enough. Thanks for the reminder to play a real game. I played the tutorial twice and wasn’t getting credit, so I reread your post. That made it so fast! Thanks! In re Poppit! Party, between both Costume Collections there are “7” costumes that have the Coilor Eraser power-up. You can use them to pop all the “Red” balloons at any point in the game. Good Luck Everyone! Sorry, the word shown as “Coilor” should be “Color”. Play in Game mode. Look for the line _e_o_e_a__. Fill in the blanks to make the following “DeRoSeTaLS”. Leave the middle S for last. I’ll give that a try, but I detest the game. Also have the 3 letter word badge. Very impressive that Jennifer figured that out! Thanks to both! Thanks so much for this info. I am glad there are very smart people on this site!!! What is happening to me is I am not getting the letters to fill in the blanks…before the game ends. I hate to just put letters anywhere but will try that next. Now I am finally getting the letters and fill them in and they are giving me 5 words per game instead of the 8. I just can’t understand why . Pogo I have a life and it is not 24-7 pogo. Please ease up on some of this. It’s giving me only 5 words also. I like this album very much. Luckily I doubled up on AWWW. I’m done with that game for a while. I’m enjoying all of the rest. No stress, no power-ups involved. Hope everybody else is enjoying it also!! I am so tired of all these Marathons; I have a life and responsibilities. Pogo go back to the old way although you won’t listen. I used my two personal challenges this week and paired them up with the badges in this album so was able to do two at a time. You don’t have to win the First Class Solitaire to get the badge. I only won 1 game and still got the badge. You get tokens just for playing and it did not take too long. Well, one thing I can say about these marathons- I am now a little over 5,000 badges! Congrats & Welcome to the 5K Club!! I am over 7000 badges. Congrats on reaching your 5,000! another marathon? Like I always say.. i will do them at my own pace. Do you all think pogo will close down sometime soon? there really isn’t a lot of people playing anymore like the old days. Many of my friends are leaving after they can’t play pinochle and other games retiring. No, Pogo’s not going anywhere. In case you have forgotten, in Poppit Party the color erasers appear in the following three costumes: Disco Dancer, 1; Nester, 1; and King, 3. This makes getting the red balloons easy. Finally finished AWWW last night, that game was very time consuming. I like to do the hardest ones first so I can enjoy the challenges like Canasta and Claire Hart. I still have to do Poppit Party, SG, and Mahjong Safari. I don’t have a lot of time since I take care of my elderly Mom. Going out to do errands, food shopping, etc. then I need to clean the house and do laundry. I do plan on having fun at a birthday party this weekend. I am grateful for the free badges but I need a break from these marathons. Monday starts Egg Hunt Week 3! Finished . Good selection. Some weren’t my favorites but mottled through them. Overall had fun and keeping busy. Congrats to all who finished and GL to all still working on it! Finished this Marathon PBA today finally. It was a fun one! I was pleasantly surprised .